Stock prices soared today to stealth bull market highs in response to Super Mario Draghi igniting the euro-zones own Inflation mega-trend as he announced the O.M.T. (One More Try) proposal to print unlimited euro's to monetize the bankrupting euro-zone nation's debts (buy government bonds), in a very similar manner to the money printing quantitative easing that has fed the stealth bull markets in asset prices since the UK and US first announced their own QE programmes way back in March 2009, that I termed at the time as being Quantitative Inflation (05 Mar 2009 - Bank of England Ignites Quantitative Inflation ) which has subsequently manifested in economies such as the UK experiencing inflation of more than 15% despite economic stagnation. The always imminent end of the trend fools that populate vast arrays of the media-sphere were once again seen running to hide behind boulders as the bear market mantra was once more busted following stock prices soaring to new bull market highs as witnessed by the S&P closing at 1,432, and the Dow closing at 13,292, less than 50 points away from its bull market high. But don't worry the bears will soon re-emerge to declare that the end of the trend is again once more imminent, especially as we manoeuvre towards the always volatile month of October. This despite the fact that if they had followed their own advice then they would have bankrupted themselves several times over as a consequence of consistently betting against what has become a mature bull market, well into its fourth year. My last analysis (16 Jun 2012 - Greece Election Eurogeddon Stock Market Trend Analysis and Forecast ) forecast a trend towards the upper end of the Dow's 2012 trading range towards a target of 13,200 by mid August that virtually matched what actually transpired. I know many want to know what happens next, however my focus this year has been more on implications of the inflation mega-trend (as a consequence of rampant money printing) as applied to the housing market, rather than what I have expected would be a range bound stock market for most of 2012. Still here is my quick take which is that momentum is clearly strongly behind today's rally which implies this trend has further to run, which means successive Dow bull market highs are likely to occur this month. I will take an in-depth look at the stock market and generate a trend trajectory when time permits. My investing strategy for the duration of the bull market has been fairly simple, as I have repeated countless times over the years, which is that the greater the deviation from the bull market high then the greater the buying opportunity presented. See the Stocks Stealth Bull Market ebook (Free Download) for examples of how one should perceive price action during multi-year trends. The ECB's announcement was always inevitable and something that I have iterated at length over the years as illustrated by the Inflation Mega-trend ebook of Jan 2010 (Free Download) that warned that the Governments via their central banks have only one solution which is to print money and monetize government debt. Therefore investors need to protect their wealth from money printing inflation by exposing themselves to assets that have first call on inflation, and are leveraged to the inflation megatrend such as commodities, and consistently dividend paying and raising stocks and more recently this years convergence towards housing market bottoms such as the UK and US presenting one of those once in a couple of decades opportunities to climb aboard what still are embryonic bull markets, just as I strongly suggested the birth of a new multi-year stocks stealth bull market in March 2009 (Stealth Bull Market Follows Stocks Bear Market Bottom at Dow 6,470). If you are not already aware then I will reiterate it once more that you need to realise the fundamental fact that the central banks are criminal institutions that today, the ECB has firmly joined its counterparts in the UK and US, and basically the crime that they are committing is one of stealing form the poor and giving to the rich, which is what QE amounts to i.e. 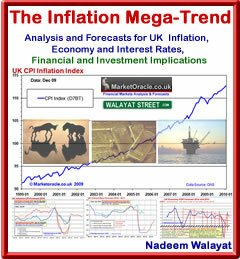 print money and inflate asset prices held primarily by the wealthy, whilst the inflation consequences are born heavily by the poor in terms of increasing costs of day to day living expenses as all prices respond to rampant money printing inflation, which is resulting in an EXPONENTIAL INFLATION MEGA-TREND, which ensures that most of the population WILL continue to get POORER. Now you can argue about the rights and wrongs about what is going on, but we don't have any power to change this systemic theft of wealth, all we can do is to attempt to be on the other side of the equation and try to at the very least protect our wealth from the systemic theft that is taking place, which is my primary focus to protect my own wealth from systemic theft. I Wish We Had Deflation! Over of the years my Inflation Mega-trend analysis has prompted many exchanges with prominent deflationistas' who I KNOW to be DELUSIONAL! However it is not because I am some how obsessed with Inflation, no it is because like a cancer Inflation is continuously eating away at my own personal wealth which forces me to spend time an energy on protecting it AGAINST Inflation. I would much rather prefer if we really were living in a Deflationary world because that would suit me infinitely better, I could just put my money in the banks and know it would be worth more in the future, instead I know if I left my money in the banks than its purchasing power will be stealthily stolen by the government to buy votes (printing debt and money) over time towards virtually zero value, because interest after taxes never matches official inflation rates let alone the real rate of inflation which tends to average about 1.5% above official CPI. So, like most people I am forced to take risks with my capital to chase the fiat currency money flows as they cycle from asset class to asset class as they pump up and then deflate asset price bubbles. To keep fully abreast of my in-depth analysis and detailed forecasts of the implications of an increasingly raging money printing induced Inflation mega-trend - from soaring prices in the shops, commodities, stocks and soon to emerge anglo-saxon housing bull markets, ensure you remain subscribed to my always FREE newsletter. I am surely not alone here in saying thank you for this above Nadeem. I also well and truly look forward to your offer of a more in-depth analysis when time is on your side. 1. ...."one of those once in a couple of decades opportunities to climb aboard what still are embryonic bull markets"
Are you referring to the stock market, commodities or housing (or all of them) when referring to the above. What timescales are involved when you refer to embrionic bull markets? 2. How high do you think the DOW could go to over the next few years? Martin Armstrong (armstrong economics) thinks it could spike to over 30,000 as the bond market initially collapses (ratio 10:1) and capital temporary goes into private assets like what happened just before the Great Depression. 3. How long is the housing cycle. Some people argue it is just over 70 years and the downleg lasts for (on average) 21 years (obviously with spikes along the way). Are you therefore stating that housing prices are currently at an embryonic bull market stage again or in a short term bull market? 4. Do you think hyperinflation is ultimately caused by higher (not lower) interest rates which means Governments have to pay back an ever increasing amount of capital and that infact hyperinflation causes many assets to go down instead of up which is contrary to popular belief? Please comment. For example: during hyperinflation (or very high inflation) people will do whatever it takes to meet their basic necessities (e.g. food, water, gas, electricity). Banks will not lend for obvious reasons and most people will sell whatever assets they have to meet their necessities. Therefore, housing prices go down, not up during very high periods of inflation (higher interest rates, banks unwilling to lend at all and cashing in just to survive), as well as stocks and shares. 5. Please take a minute or two to briefly look at Marting Armstrong's blog. Do you think this guy is delusional? He has recently stated that gold will form a temporary high this month before making new lows into January 2013(or early next year) as currently we are deflating more than central banks are printing and the big money is still in bonds. However, early next year he believes gold will bottom out and begin a major upleg into 2016/2017, as people come out of public assets (bond market) and into private assets. This is when he believes the DOW could start to make historic highs (e.g. DOW 30,000 or above). Do you agree with this, or are the markets over the last few days telling a very different story and a new bull market in commodity stocks is finally about to begin again? It is noted (however) that some commodity stocks have been in a bear market for OVER TWO YEARS now, despite initially climbing very fast from March 2009. The recent bear market has been longer than the initial bull market for many of these supposedly inflation busting mining stocks. Therefore, perhaps there is some credence to his deflationary comments with regard to credit and debt which has been ongoing ever since 2009. Governments are hell bent on taxing their citizens when in fact they should be doing the opposite. Americans are not safe no matter where they hide and some foreign banks are refusing to allow Americans bank accounts for fear of harbouring tax evasion and the punishment that might entail. Record numbers of Americans are denouncing their citizenship. Look what happened in Switzerland and other places as Governments run out of "other people's money". Armstrong believes capital hides in situations like this which is deflationary at first, before seeing the light and seeking private assets. It matters not (at first) whether central banks are depreciating currencies. It is noted, however, that there has most definitely been inflation (currency depreciation) highlighted in all basic necessities, so I would agree with most of your arguments over the last few years regarding inflation - definitely in basic necessities. HOWEVER, austerity combined with currency depreciation, draconian tax increases and bond market manipulation does not necessary equate with bull markets in commodity stocks. I would suggest the biggest bull market has been in bonds to date, not commodity stocks, however, please feel free to comment. Thank you. 6. Lastly (and importantly), if you believe that we will have very high inflation for the rest of the decade, how do you think all this will play out? For example; are we heading for an inflationary depression and if so, how will this play out and on what timeframe? Do you think higher interest rates will be the trigger? Do you think ultimately we are heading for a replay of the 1930's depression which followed a stock bubble and bond market crash or something different this time? Depressions are not normally caused by stock market crashes. It is BOND MARKET CRASHES that cause depressions. Appreciate it if you were to comment on some of the points above. Given that Dow bull market highs are likely to occur this month do you think there is a high probability that the Fed will kick off QE3 during September? 1. Housing market, specifically UK. 2. A year forward is fuzzy enough, several years is pure coin flips. I prefer swings, of 2-3 months as being most probable to gauge, that and the underlying bull market trend. 3. cycles analysis is just one component, analysis should always be the sum of the whole to arrive at the most probable scenario. For me, for approaching a year that has been towards gradually gearing my portfolio towards rising house prices. Don't take that as a forecast as my last in-depth analysis of several years ago forecast a depression into the beginning of 2012. That has come to pass, the current phase requires a lot more analysis before I generate a forecast trend, but the signs are for an embryonic bull market to emerge this year for which won't see signs of it in any economic data that will come much later. 4. Hyperinflation is caused by loss of confidence in fiat currency as a consequence of government panic actions to print money to calm revolting populations. It's a panic event after a series of events where governments are seen to lose control over society. Whilst the risk of hyperinflation has increased, I still see it as being at less than 10%. 5. I don't tend to investigate others as if I went down that road I would not have any time left to do my own analysis. But it's easy to check, just Google what they said in the past say 2 or 3 years ago and see what transpired. Gold and silver are a tiny part of my portfolio (about 3%) so I have had no real reason to take the time to do in-depth analysis. However if Armstrong is / has been forecasting deflation then, yes that is delusional, because we are not going to get deflation, yes asset bubbles will pop and deflate as fiat currency cycles between assets, which deflation fools will jump on to focus on what are mere corrections to the preceding UP TRENDS! , as we have seen with housing, but no deflation proper as the example of the 1930's. 6. The illusion is that the money (debt) will be repaid. That illusion is still very powerful that allows individuals and business to make very different decisions to what they would do otherwise i.e. no one considers borrowing money as fraud, but virtually everyone would consider perpetual money printing spending as fiat currency fraud. We have been in an inflationary depression since 2009. That's zero growth and 15% inflation (UK), that is the trend. Inflation will come in waves and be exponential i.e. it compounds year on year. My best long-term guesstimate is that the annual UK inflation rate will oscillate between 2% and 5% for this whole decade (CPI), real is CPI+1.5%. Against this we have perpetual central bank propaganda about the risk of deflation. My original scenario dating back to 2007 was for 7 years of pain we appear to be on track therefore economy wise, 2014 should be the start of another multi-year boom, again this requires updated in-depth analysis to fine tune when I start to see this trend change manifesting where a housing market turning around is just one (important) precursor of so it makes sense that that should start to take place this year as it takes time for momentum to build. QE3 - QE when ? Not sure but there will be QE3 then 4 and so on as long as there is a budget deficit and sub trend growth. I think that answers virtually every point? market, unless I see something there that perks my interests elsewhere that is what I intend to write most about over the coming months in terms of in-depth analysis. Thank you for posting some replies in relation to the above. I understand much of your focus is now on housing, but do you have any initial thoughts of when the current stocks bull market is likely to end (e.g. 2013/2014/2015..FTSE/DOW)? I would be interested to learn your thoughts and understand that these are just your thoughts, nothing else. Also, one of your earlier articles mentioned something about trading. I eagerly encourage you to do a piece on this - most specifically on when you think one should enter the market and when one should exit. For example; if you were to follow a swing trading technique, how might you use a certain arrangement of bars or price level to enter a probability trade and what sequence of events would lead you to exiting a profitable trade and what type of stop loss might you use (e.g. fixed percentage, trend line, support level or something else)? Whatever the method you use, it would be interesting to hear more on this subject from you. You are correct though, 90% (I would argue higher) do fail as traders/day traders which the spradbetting fraternity can (I am sure) be truly grateful. When trading, do you have an opinion on what timeframe is preferable (e.g. hourly, daily, weekly)? Did Gann's ("How to Make profits...") help in formulating trading strategies and ideas for you and if so, how? If you really studied this book, what did you glean from your studies? I do understand that sometimes the best trading decisions are in those situations where it is best not to trade, so what market conditions would determine when you would trade or invest in a particular market? I am assuming you trade trending markets, so therefore a trending market was the context to my trading question(s) above. Lastly, may I ask where you get most of your information from in coming to your analysis of the markets? I only ask because a lot of the information out there is not to be trusted (or is just propaganda), so in order to make high probability conclusions or assumptions, the information one is relying on must be accurate. I plan to do a series of articles on trading and investing that will answer the above and more.